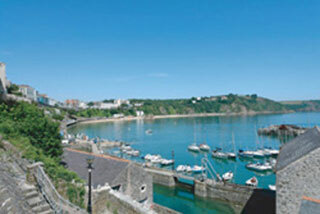 Escape, relax, explore the National Park from peaceful location midway Tenby and Pembroke. During Spring, Summer and Autumn Rosedene’s doors are opened to visitors who appreciate its picturesque setting. Nestling in cared-for grounds, you’ll find us located just below the ancient church alongside the well-kept village green. Hodgeston is a small village set in the National Park, on the coastal road from Tenby to Pembroke, with a rural (but not isolated) aspect. A narrow lane alongside Rosedene winds its way for about a mile to the coastal footpath, with spectacular views of long sandy beaches and small coves. In Spring the cliffs provide a hideaway for nesting birds and in late Summer the Atlantic Grey Seal can sometimes be glimpsed basking on rocks with her pup. The easily accessible beach at Freshwater East is just 1.5 miles whilst the idyllic Barafundle Bay is just 5 miles. Clues to Pembrokeshire’s Norman history and ancient past are all around with magnificent castles at Pembroke and Carew and a ruined palace at Lamphey. There’s plenty to do in this fascinating County – riding, fishing, walking, golf, water sports and boat trips being just a few. Excellent local shops, pubs and restaurants are within easy reach and both Pembroke and Tenby are thriving holiday centres. Pembrokeshire’s appeal is to both young and old alike: once smitten our guests return time after time. Rosedene’s colourful window boxes and borders will be appreciated by the gardeners amongst you whilst hearty eaters will appreciate our multi-choice breakfasts with fresh, local produce. We also offer a healthy eating alternative and vegetarians are welcome. 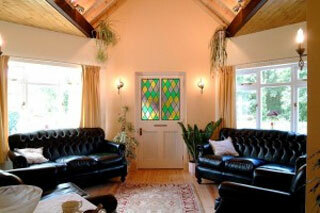 Our dining room is light and airy, looking out onto the garden and a small, natural wood. And in the evening feel free to sink into comfortable leather chairs in our outstanding new lounge to read, chat or simply relax! Rosedene is friendly and comfortable, being maintained and furnished to a high standard. 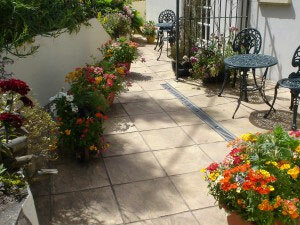 All bedrooms are on the ground floor, having en-suite tiled shower, WC, wash basin, etc. Each room is tastefully decorated, has co-ordinated furnishings, flat screen colour TV with Freeview and free WiFi available, courtesy tray, information packs, etc. Small luxury touches give additional pleasure, whilst oil-fired central heating ensures a warm welcome whatever the season. Double, twin or family rooms are available – five of the rooms being of de-luxe standard with private garden patios. Additionally, one double room has a four poster bed and another a king size bed. Wales Tourist Board have graded Rosedene a four star guest house, awarding a Grade 1 in their Tourism for All scheme – one de-luxe bedroom being specifically adapted for the disabled, all rooms accessible by wheelchair, entrance ramped and the car park flat and immediately adjacent. Click the logo above to read positive feedback from our happy customers.